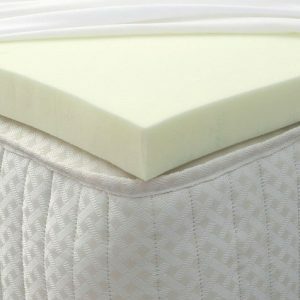 Reasons to Buy a Memory Foam Mattress Topper – Foam Factory, Inc.
One of the most frequently asked questions we get here at FoamByMail.com is, “Why should I buy a mattress topper?” After all, shoppers in the market for memory foam sleep products typically choose a full mattress rather than just a mattress topper. But there are actually some instances where a memory foam mattress topper could be a better solution for you than an entire mattress. Here are a few cases where we would recommend looking at mattress toppers instead. To extend the life of your current mattress. The most common reason to buy a memory foam mattress topper is to extend the life of your current mattress. A memory foam mattress topper can add years to standard spring mattresses and breathe new life into old memory foam mattresses. You can’t afford a memory foam mattress right now. Let’s face it, we all come up against personal budget crises from time to time, and replacing a mattress typically falls low on the list of life emergencies. Buying a memory foam mattress topper is a fantastic way to enjoy memory foam comfort and support until you can afford to buy the whole mattress. You wish to make a sleeper sofa more comfortable. If guests frequently find themselves spending the night on your sleeper sofa, then a memory foam mattress topper is a must-have to protect backs, shoulders, hips, and knees from support bars, springs, and other sofa protrusions. You want to improve a dormitory mattress. Dormitory mattresses are notoriously uncomfortable due to a variety of reasons, such as age, poor quality, and wear and tear. Adding a memory foam mattress topper is a quick and affordable fix for any college student. You go camping in an RV. Unless you have a luxury motor coach, chances are the sleeping quarters in your RV leave a lot to be desired. Bringing along a memory foam mattress topper when you hit the road will give you a great night’s rest wherever your travels take you. Your children often have sleepovers. More convenient than big daybeds and more comfortable than sleeping bags, memory foam mattress toppers can be placed directly on the floor to accommodate young sleepers during weekend slumber parties. If any of the above situations apply to your life, then a memory foam mattress topper could be the right product for you. Check out FoamByMail.com today for more information. The article link will be included in the email automatically.